Portfolio of a Software Company can tell you lot about any selected software company. Whether you want to select the best software development company to develop a custom software application for you or you want to hire the services of a company to modify or add new features to your existing software application, having a look at the company portfolio can be really time saver. Yes software companies are careful to accept only the software applications that they can create and manage successfully, still portfolio of a software company tells you what work the employees of the company have done in past. It is like taking an interview of a candidate before hiring him / her for any given job and yes an informed decision is worth the time and efforts spent. Our Portfolio to display Custom Macintosh, Windows, Android and Linux Applications Developed by us. Our Portfolio displays few small software applications to display what are our capabilities and what work we can do for you. Our Portfolio is rich with lots of custom software applications developed so far. We have developed applications for Windows covering System Utilities, Database Applications, Applications communicating with other applications and devices and lots more. 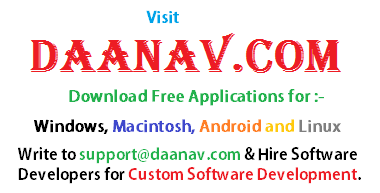 Apart from Windows based applications we have developed Macintosh Applications, Linux Tools and Android Apps. You will find lots of sample utilities on our portfolio website, however not all applications are listed on our portfolio website due to signed NDA with client or other reasons. We fully evaluate the project requests that we receive and only when we are fully confident of the underlying technology and related concepts, we go ahead and provide you the software development services. Yes you can even hire new software developers and other staff to work in our Panaji – Goa based office, while you yourself communicate with the hired short term or long term employee and get your job done. Hiring Indian Software Developers can be a cheaper alternative, and yes there are lots of software developers available for projects. You can benefit from custom software development and from our experience in this software development industry. Apart from Software development Services, we offer website designing, SEO and other software based services. Let’s say for instance, this website is a WordPress website which allows our content writers to add content to the website easily and quickly. Our Portfolio website is constantly updated with new software applications, new free content and lots of other stuff. Software Products face stiff competition, they have to fight piracy, manage online payments and most importantly reach out to public. Contact Us now and let our experienced and professional staff provide you all the software and website services you need.